The Good Food Company sits at 31 Bridge Street. It’s cozy, quaint and clean and seats 28 people for breakfast, brunch and lunch. You can’t miss this charming building with its elegant eggplant purple and lime green painted entrance. 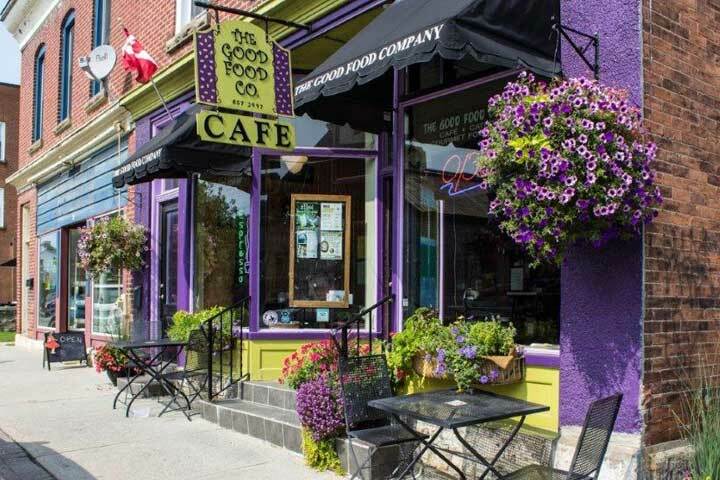 First opened in August 1997, the Good Food Co recently celebrated their 10th Anniversary! Petra Graber is the owner of the Good Food Company. She feels says the Good Food Company is successful because she keeps it small, manageable and consistent. The Good Food Company prides itself on using local fresh ingredients and from scratch food items. My goal is to use as many local products as possible says Graber. The Good Food Company serves Baker Bob’s bread from Almonte, and buys its eggs from cage-free hens at Bekings Poultry Farm. The hollandaise sauce is made in-house for eggs benedict. “We just use eggs, butter and a bit of lemon juice – that’s it, no additives,” Graber said. All the desserts are made from scratch and the restaurant is now selling Fluid Solar Roasted Coffee – a new coffee roaster from Clayton, Ontario. “We try to keep things as local as possible,” Graber said. “I would love to not have a car and to be able to just walk to everything I need,” she added, explaining that she lives above the restaurant. “I really believe in supporting local businesses and the people that live in your community,” Graber said. The Good Food Company occupies the building that was once Mac Williams’ Pharmacy. The restaurant has 4.7 stars on Google and was called “utterly sophisticated comfort food,” by Anne DesBrisay of the Ottawa Citizen in 1999. Call (613) 257-7284 to make reservations for private dinner parties or regarding off-site catering. Check http://goodfoodco.restaurantengine.com/or e-mail Petra Graber at goodfoodco@bellnet.ca for other inquiries.